One of the main reasons property owners hire a competent project manager is to reduce and hopefully eliminate altogether any conflicts that may occur on their busy construction site. Every building project is unique, and the more complex the requirements, the more tradespeople will need access to space and resources. When their schedules conflict, there’s potential for friction unless things are carefully sorted out in advance. 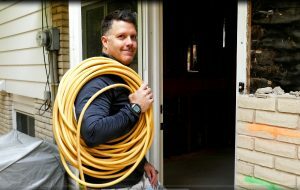 Any problems that arise between the trades usually happen when there’s limited space, and that’s often compounded by a small driveway, or lack of resources like water, or only one functioning power outlet on site. A good construction manager makes sure the right people get access to the right place at the right time. He or she also keeps close watch on all storage areas and cleans and secures the property at the end of each workday. This overseer makes sure that workers can connect to their own and to the property’s resources through the week and on weekends too if necessary (and bylaws allow their trade craft). Inside a home we’re remodeling in Burlington, seen in the accompanying photos, there’s a set order of business. Once the building has been completely gutted, and with just the original 2×4 studs left holding up the ceiling, we make room for big changes. New structural steel needs to be added before more walls can be removed. Then HVAC technicians, followed by electricians and plumbers will appear. At some point next week the old home will be cleared of all tools and equipment and swept clean again for the spray foam insulation contractors. The hazmat-suited artisans need a completely empty construction site for two or three days due to the temporary fumes they produce, and the heavy hoses and scaffolding they push around each room. And nobody wants to share the site with them anyway. Once all that happens, the walls are prepared and enclosed behind vapour barrier before being dry-walled. During each of these treatments there’s an emphasis on keeping the doorways clear of equipment and water hoses and power cords that cross the threshold should be secured and trip hazards minimized. Unrestricted access to doorways is a concern for all manner of deliveries inside the building. There is a method to the madness of a modern construction site, but with so many variables at play, unless there’s a monitor, things will be pandemonium. Case in point, here’s the lumber delivery man from RONA who had to access the garage over the flowerbed because two huge demolition bins filled with bricks and stone and other debris were blocking the drive. So reckless was the bin delivery on the driveway that the doors of the first unit could not be closed due to the close proximity of the second bin. Doors that cannot be closed means bins cannot be completely filled. Keith had to ask the lumber delivery man if he would mind moving the bin to the left a smidgen with his forklift, and he gave the guy twenty bucks for the bother. Third party contractors like dealing with project managers who can reference a schedule and set perfect times for deliveries. Suppliers give preference to the people they like dealing with, and the places they know and trust to be efficient; if the delivery-routes are at the discretion of the drivers, they’ll build their loads with the easy drops on top. But some suppliers are unpredictable, and will show up at odd times despite their materials being ordered for delivery on another day. This can cause mayhem on site as they unload their wares in the path of other workers. Below you can see a flooring tile delivery being interrupted by pool installers who demand the driver move his van out of the driveway to make room for a big (expensive) dump truck that was scheduled to appear at that time with a load of sand. The flooring delivery driver was understandably reluctant to move; he would have to carry the heavy tiles even further if he moved now, and allowed the dump truck into the zone, and he didn’t like the idea of carrying the heavy tiles over the forthcoming sand pile. But it was his own company’s dispatcher’s fault as his delivery was late, and in a Perfect World his tiles would have already been stacked in the garage before the sand dune appeared on the driveway. It all worked out in the end, as other contractors pitched in to help the driver access the garage after the dump truck left its sandy load on the pavement. Good project managers also help resolve conflict between contractors and property owners. Everyone wants to see the construction completed and such disputes can lead to eternal delays. Indeed many tradespeople are so busy they can afford to leave jobs unfinished as a negotiation tactic. This is often a worse case scenario for homeowners as their unfinished elements will have a ripple effect and put everyone behind schedule. Keith Travers has been a project manager for over a decade. With a large Rolodex of skilled tradespeople he trusts and admires, he makes it look easy to schedule the right people at the right time and thereby avoid all such unnecessary and expensive delays.